We compared costs and published our Single Hung VS Double Hung Windows Const Guide. For all details, browse our guide now available online. When you are choosing your new house, you will most probably consider important factors such as its location, architectural style, the price, the surroundings and etc. And that is absolutely understandable. But a very interesting fact is that most of the people pay attention to one very small detail that can actually significantly affect the future exploitation of the home. Surprisingly, how bright the rooms in a house are is something that people are paying enormous attention to when they are considering buying or renting a place. But why is the presence of daylight in your home so important? The amount of daylight that penetrates the living area has tremendous effect on its comfortable exploitation. There is no better feeling than waking up on a Saturday morning and drinking a coffee in the entertaining company of the sunlight in your kitchen. And on the other hand – it is scientifically proven that if your home is darker and lacks any significant daylight, you may feel more unsatisfied, unmotivated and prone to procrastination in your daily tasks. What determines the amount of daylight in your home, to the most extent are the windows. So, if you are one of those who prefer having a bright and sunny living spaces, pay significant attention to the type of the windows, as well as their size and location. From the first sight, you can say whether a room has enough windows to ensure a proper amount of daylight. But if you are starting from scratch or you have decided to redecorate your home, you may wonder what type of windows are the best fit. When it comes to choosing the appropriate window design, there are many important considerations that you should bear in mind. In order to choose the best option which will ensure that there is enough daylight in your living spaces, you should do a significant research or consult a professional interior designer. This guide is intended to help you navigate the different possibilities when it comes to choosing the best type of windows, according to the specifications of your rooms, your budget and the final effect that you want to achieve. If you would like to find out which are the most popular choices for your home, then ask a kid to draw a house for you. There is a very high probability that the drawing will contain a rectangular house with a triangular roof, a door and a single- or double-hung windows. And that is the answer to the question – the single-hung and the double-hung windows are the most popular types of windows that have been around for centuries. Yet they are still a very effective and widely preferred choice when it comes to the design of modern houses. The single- and double-hung type are vertical-sliding windows with a frame that is located in their upper and lower part. The role of this frame which is also known as “sash” is to hold the glass and ensure its stability. This types of windows also have the so called “muntins” and “mullions” which are basically a thin wooden (or other material) parts of the frame that divide the glass in order to carry a part of the weight. The difference between them is very simple – with the single-hung windows, you are able to move only the sash that is located in the bottom, while with the double-hung you can slide the upper one too. But in order to find out which one of them is the most appropriate for certain types of projects, their main characteristics, pros and cons should be examined first. As a very simplistic type of window, the single-hung ones are very widely spread among the older houses. That is one of the main reasons why many people still fancy them – because of the very authentic and vintage look that they bring. 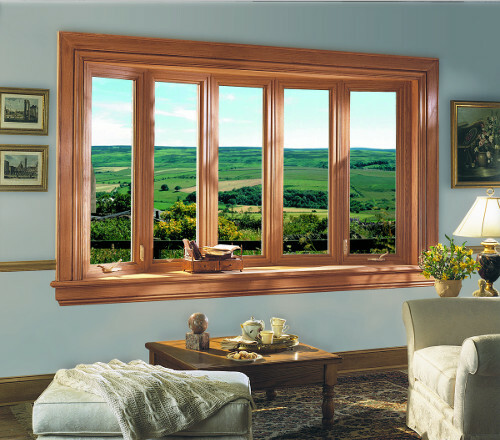 Many of the single-hung windows’ fans choose them because of the better stability that the fixed upper sash ensures. The fact that only the bottom one can be moved up or down, makes them more weather-resistant. 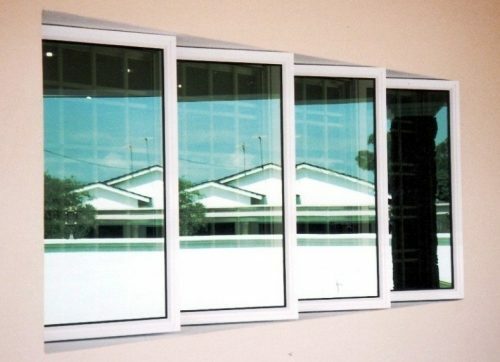 As this type of windows is very resistant to air infiltration and water leakage, it is claimed that they can last for a very long period of time without any potential problems to occur. Nevertheless, after many years of exploitation, some components of the window, such as the sealant layer, may experience the need to be repaired. 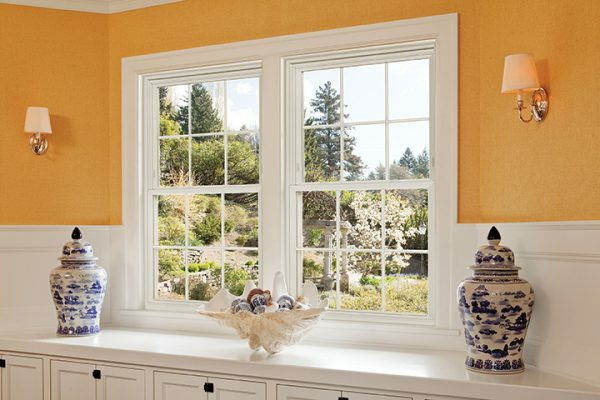 One of the main cons of the single-hung windows is the fact that if the upper sash breaks, most of the time a professional is needed for it to be replaced. This process is very hard to be handled by the homeowner himself, unlike the case with the double-hung windows where it is way easier and no professional help from a glazier is needed. The maintenance of the single-hung windows is a little bit harder than the one of the double-hung. The fact that the bottom panel usually slides up and to some extent covers the upper one makes the cleaning process hard and time-consuming. The task gets even harder if the single-hung window is installed on an upper floor. If you start exploring a random neighborhood, the chance that the majority of the windows on the different buildings are double-hung is very big. This is because they are the most common type for both old and new buildings. Their popularity is based on the fact that they are very easy to clean. Double-hung windows (except the older ones which lack the tilt-out function) can be effectively cleaned and maintained from inside the house, which can’t be done with the single-hung ones. Another important advantage of the double-hung windows is the fact that the upper sash can be opened, which will provide additional option in terms of the airflow. Many homeowners which have double-hung windows prefer to open both the upper and the lower sash at the same time, so that they can have two different paths for the airflow to circulate in and out of the room. This type of windows is a preferred option for households with little children because the lower sash can be locked and still have fresh air entering the room through the upper one. Double-hung windows are also safer than the single ones because they have two locks instead of one. They are also way heavier, with stronger frames and sashes which makes them harder to break, when compared to the single-hung windows. Bear in mind that whatever window type you choose, you will need to hire a professional to handle its installation (for some single-hung windows, you can try to do it by yourself, if you find some additional hand to help you with lifting the window unit). Nevertheless, it is useful to know that the double-hung window is harder to install, because it is heavier and requires more precise placement. Except all the listed points on windows’ features, location and installation, there is another very important characteristic that you should carefully consider. 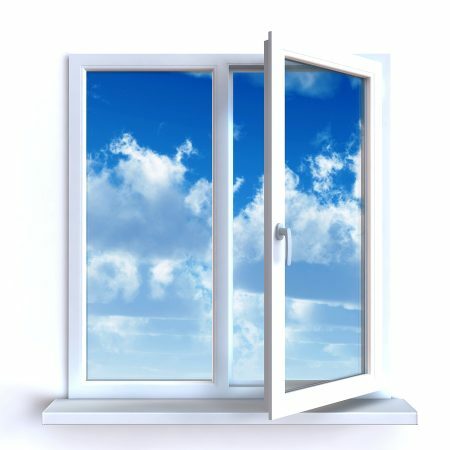 As it was already pointed out, more than 35% of the heat transfer in your home is due to inefficient windows. 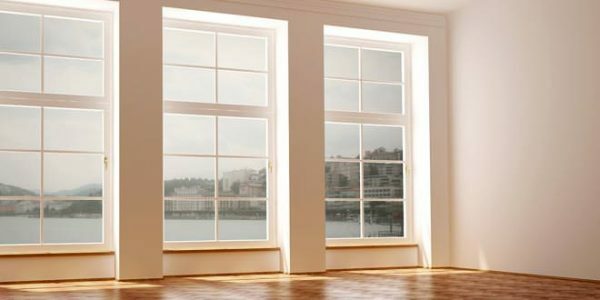 As the windows in your home may cover anywhere between 20% to 60% of your walls, depending on their design, the energy efficiency is something very important that should be considered when choosing the right solution for your project. 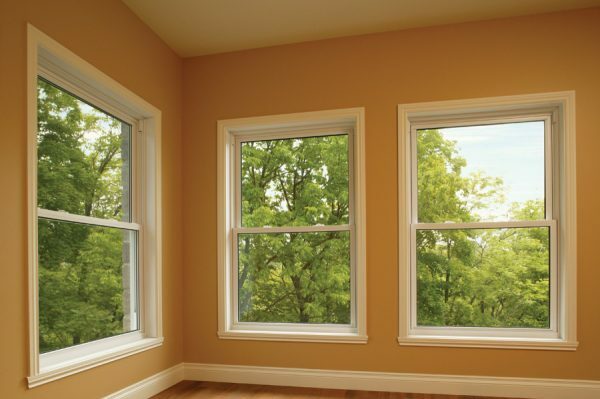 Single-hung windows for example, are more efficient than the double-hung ones because of their static sash. A panel being fixed reduces the number of gaps or little slits that may appear in the areas where the window is in contact with the frame and the surrounding elements of the wall. In the recent years, the double-hung windows have significantly improved their quality and if decide to choose a more expensive option, you can be sure that no problems with the moving panels and the stability of the window unit will occur. Whatever type of window you decide to buy, bear in mind that choosing a double-pane option will always be your best move. The effective insulation that such solutions provide, will guarantee a very good heat retention and will further help you to optimize your energy bills. Double-pane windows are based on the idea of creating a solid “envelope” of dual layers of glass and vacuum between them. That vacuum serves as a heat barrier that will help you regulate the temperature in your home way easily and effectively. This is the basic material used for windowpanes. If you are about to buy the cheapest single- or double-hung window set, expect the glass components to be from this type. It will do the basic job but will not guarantee you any energy efficiency or UV protection. Nevertheless, if your walls attract your neighbor’s kids to play basket or baseball nearby, then this will be your most-suitable choice. 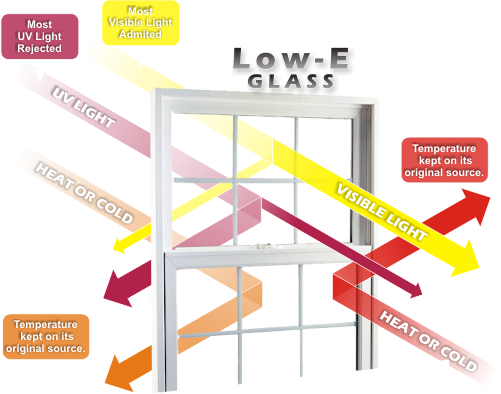 You won’t be wrong if you decide to choose the glass components of your windows with a low-e coating. The very tiny and detailed finish of metal oxide that will be placed on the surface of the glass will ensure the effective reflective ability of your single- or double-hung windows. That way, a very high percentage of the energy that you generate for cooling or warming your home will be retained, thus significantly optimizing the energy efficiency of your home. One of the premium choices that you can find on the market, when it comes to the low-e glasses are those which have a thin argon layer for better insulation. Producers apply different kinds of tints (such as green, bronze, gray or etc.) to the windows, which later on result in significant reduce of the heat gain. That technology allows the windows to absorb approximately 45% of the sun energy which significantly increases their performance efficiency. In the search of more and more efficient technologies for better energy-saving mechanisms, glasses are produced with a thin reflective film that is very useful for heat gain during the hot summer months. Applying such layer also ensures an enhanced control over the year-around amount of sunlight transmitted through the windows. When you are about to buy the single- or double-hung windows for your home, you will have the opportunity to choose from single, dual or even triple-panes of glass systems for each unit. Bear in mind that the single-pane option is the least energy efficient one as it provides only one thin glass barrier with low insulating capabilities. Thus, the more layers of glass you have, the more efficient your windows will be. The bigger vacuum that is present with the dual and triple-pane options significantly increases the window’s ability to resist the heat from the outside. The frame is one of the most important components that determine the comfortable exploitation of the whole window unit. Because of the fact that the frame may last longer than the glass itself, many people decide to save some money and to renovate their windows by changing only the glass and doing some restoration work for refreshing the look of the frames. But that may not be the best possible choice because of the fact that window frames may be a strong prerequisite for future problems such as moisture leakage, reduced structural stability, worsened insulation qualities and etc. So when it comes to choosing the right type of the window frame for your project, it is important to be acquainted with the different materials that are available on the market. This is the most common choice. Although a not so long-lasting material, the wood is very beautiful and interesting choice that can fulfill almost all of your design ideas. There are different variations of the material which can include also different composite materials, plastic, wood fibers and etc. The wood provides you with the opportunity to redecorate it once in a while with the only help of a bucket of varnish. Periodical impregnation of the wood will ensure its amazing look and guaranteed resistance to aggressive climate conditions. These are the cheapest options available on the market. The vinyl frames do not require painting or staining and will ensure quality and long-lasting exploitation. Nevertheless, most of these options are white and cannot be painted which significantly reduces the number of possible design combinations that you can take advantage of. The fiberglass frames are relatively new one. They can be painted and redecorated in your desired nuance. They are very stable and will guarantee a significantly-prolonged exploitation period. Their durability is ensured by the specially-designed fiberglass needles that are embed in the structure of the frame, making them a strong and stable solution for your windows. 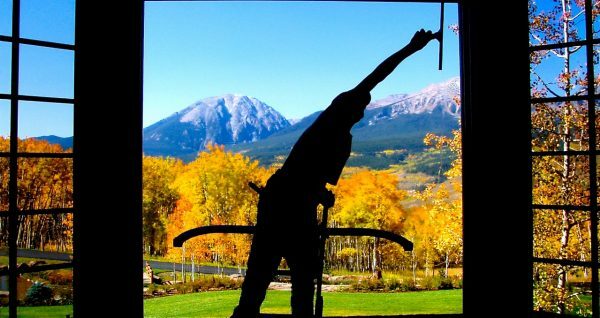 Window installation or replacement – how much does it cost? At some point of the exploitation of your home, you may experience the need to replace the existing windows with new ones. The reasons for that may be more than one. For example – your window frames may be too old and while they have served effectively for so many years, the negative effect from the sunlight, heavy rains, hails and etc. may now start to seem more and more visible. Another very important reason why people decide to change their old windows is the energy efficiency factor. An underestimated fact is that almost 35% of the cool and the warm temperature during the summer and the winter months respectively, is lost through the windows. So investing in efficient double- or triple-panes is a very good way to reduce your energy bills. Leaking moisture, mold formation potential, damaged fits, broken locks – these are also very widely spread problems that may require for you to deal with the replacement of your existing windows. No matter what the reason for your window replacement is – whether it is an exploitation problem or you just want to redesign your home, you should be aware that the cost is significant. Expert’s reports suggest that the cost of your window replacement project can take anywhere in the range from $8 000 to $20 000. But let’s find out why such process may cost so much. Due to their simpler construction and light body frames, the single-hung windows may cost from 15% to 25% less than the double-hung ones. Depending on the different types of materials and the features that you want your windows to have, you can expect to pay anywhere from $100 to $450 per piece. It is important to know that you will receive your window as a fixed unit that should be installed in a frame and then installed. That makes the installation process a not-so difficult task that can be handled even by the DIY enthusiast. On the other hand, the double-hung windows are a very different challenge. Most of the options on the market consist two panels that should be installed and immediately checked for the smooth operation of the upper and the lower part to be ensured. This type of windows is a little bit heavier and require more specific installation as they must be very precisely mounted in the frame. That is why, hiring a professional will be your best choice as you do not want to risk breaking the glass and harming your health. When it comes to the cost of the double-hung windows, it is important to know that the average pricing range start from $200 and can go up to $800 per piece. As the installation of the single-hung windows may be handled DIY, in the case with the double ones it is quite different. Because of the fact that they are heavier and require more precise placement, you will need to hire a professional. The cost of labor when it comes to the installation of double-hung windows is estimated to be in the range of $200 to $400 per window. The price may vary depending on the number of windows that should be installed, their location and the complexity of the task. If you decide not to risk with the installation of the single-hung windows and seek professional assistance, you should expect to be charged $50 to $100 per window, once again – depending on the type of the project. So the final cost can vary widely. Nevertheless, bear in mind that the installation of new windows is a serious project that can have an overall effect on the look of your home, as well as its comfort and climate. If you are wondering whether you should save some additional dollars and choosing a more budget solution, then you should probably think twice. Investing in window units is an important decision for the future exploitation of your home and going for the cheapest solution will not be your best choice. Take in mind the safety, the energy-efficiency, the look, the air flow and its control, as well as many other important characteristics, that will have effect on your comfort for the long term. Whatever type of window you chose, there are further tips and tricks that can help you maintain and retain their beautiful look for the long-term. Being informed about their safety exploitation, cleaning, long-term maintenance and other significant topics is from main importance, so take a look in the following advice and get use of them when you are about to buy your new window sets. If you have decided to install single-hung windows on the upper floors, you will have some troubles with the cleaning process. As you won’t be able to clean them from the inside of your home, to make it easier, get a ladder and a longer brush so that you can reach every spot on the window’s surface. Remember to get a soft brush because, depending on the material that they are made from, the frames of the windows may be easily harmed (scratches, loss of the glossy finish and etc.). Cleaning from a ladder or with a long brush may not be comfortable, but do not make the mistake to press hard on the glass panels, as they may break easily. If you have double-hung windows, then the cleaning process will be way easier, even if they are installed on the second floor or above. You can either clean them from the inside, or from the outside by using water pressure (do not put much pressure as it may damage the paint or loosen the frame). Cleaning the single-hung windows with water pressure is not advisable as they are way lighter and more fragile, when compared to the double-hung ones. When choosing the best solution for your project, bear in mind that some highly energy-efficient windows provide additional benefits such as a discount on your energy bills. In some states there are even tax breaks for homeowners and businesses which decide to install energy-efficient window units. Do some initial research for the different factors that affect the energy efficiency of the window unit like the U-value for example (U-values measure the insulating capabilities of the window – the lower the value, the better result you will get). Taking in mind the climate in your state is also vital – for example, in Southern climates, the best choice for you is to buy a window unit with a lower solar heat gain coefficient, which will ensure the effective barrier against sun rays. On the other hand, if you live in the Northern states, low U-value windows will be your best choice. For further information on the energy efficiency, it is advisable for you to check the requirements of the ENERGY STAR® program, established by the U.S.
Environmental Protection Agency and the U.S. Department of Energy, with the idea to serve as a helpful guidance for every homeowner’s choice of windows in accordance with the specific climate. Another thing to look for is whether the window that you intend to buy has the NFRC (National Fenestration Council) label on it. This mark provides information about the performance of the window in terms of cooling and heating your home. So, do not hesitate and ask the professional consultant in your local store to find out which is the best solution for your project. Remember to calculate the effect of the energy-efficient window in the long-term and be ready to spend a little bit more as an initial investment, which will repay itself in the next few years and will then start to earn you money. before buying the desired set of single- or double-hung windows, remember to check the way their mechanisms work. The operating of the units should be smooth and done with ease. Check how much of the corners and the different spots on the window’s surface can be reached, so that you will be aware of how easily you can clean it later on, if you decide to buy it. Depending on the place where you intend to install the window, check its design and features – whether the window will fit accordingly, will it be easy to open and whether the effect of the different features will be able to reach their full potential in which you have invested. Bear in mind to check the way the sashes function as well. Windows are the only components of your home that affect the look and the comfort of both the interior and the exterior. They have the power to significantly transform the style of your living area, as well as increase the level of enjoyment for the hours spent with your beloved ones. Choosing the type of window that will successfully fit the needs of your project is a very important and complex process that may require significant time and efforts, but the final result is guaranteed. Take the needed time, do your research and learn as much as possible about the different options of window units that you can choose from to maximize the value of your investment and for the long-term.